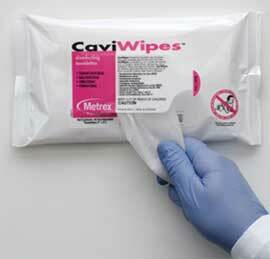 CaviWipes in a Flat Pack, 7" x 9" 45/Pk. Disposable Towelettes Presaturated with CaviCide Surface Disinfectant Cleaner. Kills TB in 3 minutes and MRSA, HIV-1, HBV and HCV in 2 minutes. For Use as Directed on Hard, Nonporous Surfaces. Resealable Soft Pack with Patented Adhesive Backed Strips. 45 Wipes per Pack.